This arrangement has a corsage of Roses and a Singapore Orchid set amongst greenery on a pillow of more than fifty-five Carnations, exuberating elegance and style. 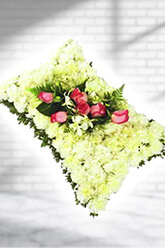 It is designed to be an exceptional funeral or sympathy gift of reverence and respect. The style makes it equally well suited for decoration at weddings and christenings. The perfect floral tribute to my darling wife.. It was great and your customer care was of great help, courteous and pleasant. Her name is Evita. Hope the flowers will reach on time. I was contacted promptly about any changes that would be and were made. I was very happy with the final arrangement. I will be using this business again. What an absolutely fantastic service, we are from England and needed to get flowers delivered for my uncles funeral in NZ they arrived within hours of my request. Can't thank you enough. Thanks so much for the excellent service. staffs were very helpful and well-mannered. I'll definitely recommend to other people when get chance.